Liverpool's first bottomless* Gin & Tonic brunch. We host Cocktail Masterclasses with expert mixologists teaching you the tricks of the trade while you get to sample your creations! Start your weekend a day early an come along to NYL for our Classic RnB night every Thursday from 6pm untill late! With the best of today’s music from DJ Spykatcha and a wide range of cocktails and drinks to enjoy. No need to book, we’ll see you there! Each and every Friday enjoy 3 beers for only £10 and a glass of Prosecco from just £4. There is also 20% off of your food bill between 5pm - 7pm, who needs any other excuse for dinner and drinks after work! 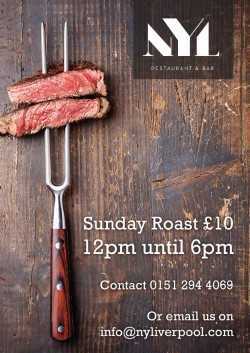 Enjoy a delicious Sunday Roast with a drink in NYL for only £10! Offer valid every Sunday between 12pm and 6pm. The Big Apple comes to the heart of the Liverpool with a unique, homemade New York inspired afternoon tea. With 3 tiers of New York inspired treats, this brand new offering comes from the talented team that brought you Fashion Afternoon Tea. Available Friday - Sunday from 12pm – 5pm. Booking is essential. Vegetarian options available upon request. Any allergens must be informed upon bookings. A £5 non-refundable deposit is required upon booking. To book click here or call 0151 294 4069. *offer applies to selected cocktails.